Downtown Greensburg is an eclectic mix of historic and trendy. A vibrant cultural district, a strong commitment by the City to urban renewal, a thriving shopping district, and a growing population all combine to create a renewed energy in downtown Greensburg. While residents support the downtown, Greensburg businesses are not reliant on Greensburg residents for customers and clients. Many of the surrounding townships have larger populations who travel to downtown Greensburg for shopping and entertainment experiences not available in the communities in which they live. If your business would benefit from being located in a distinctive setting that is continuing to grow in popularity, downtown Greensburg is the place for you. Specialty retail fits perfectly into Greensburg’s long-range strategy for success. The Greensburg Community Development Corporation works with commercial property owners and entrepreneurs to “cluster” like and supporting businesses. In this way, we are expanding a shopping district that invites customers to visit multiple stores within a pleasant pedestrian setting. Historically, certain retail businesses do better in active cultural and shopping districts. The following list (not intended to be comprehensive) provides examples of retail businesses that are a good fit for downtown Greensburg. The strength of Greensburg’s cultural district is that it provides multiple unique experiences both before and after the performance. Clustering together like and supporting businesses – creating interesting, welcoming dining and drinking locations in close relationship to cultural institutions -invites visitors to enjoy multiple Greensburg establishments. 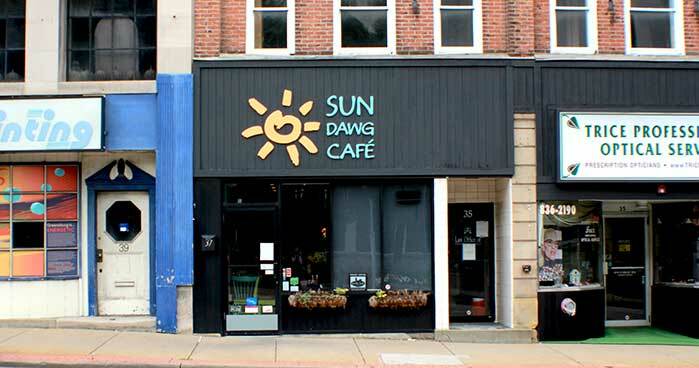 The following list (not intended to be comprehensive) provides examples of hospitality businesses that are a good fit for downtown Greensburg. Some entrepreneurs blend a desire to own a business with a creative talent. Creative entrepreneurs such as these find that the strength of Greensburg’s cultural and shopping districts is an important factor in their decision to locate a business downtown. They know that establishing artistic and creative businesses in close relationship to cultural institutions and retail locations invites customers to visit multiple establishments. The following list (not intended to be comprehensive) provides examples of arts, culture, and entertainment businesses that are a good fit for downtown Greensburg. With Greensburg’s Main Street District as the core, the Greensburg Community Development Corporation has made the downtown a priority for renewal projects. Funds for building rehabilitation, streetscape improvements, and special projects are available. Visit the Incentives Programs for more information. Downtown Greensburg is centrally located in Westmoreland County and adjacent to growing populations in Hempfield, Unity, and Penn Townships. For more information on why your business should Think Greensburg, contact the Greensburg Community Development Corporation at gcdc@thinkgreensburg.com or 724-689-0040.